How to help — Southern California Dachshund Relief Inc. There are many ways to help our rescue! We appreciate any help you can give! Think having an additional dog would be fun, but are not sure if you are ready? Have a dachshund who loves other dogs, but you are not quite ready for the commitment of two permanent dogs? Like the idea of helping to find homes for unwanted dachshunds in California? If you answered YES to any of these questions, then Southern California Dachshund Rescue (SCDR) needs your help! Since 1994, SCDR has rescued, rehabilitated and rehomed hundreds of dachshunds. We do not kennel our doxies while they are waiting for homes; we rely on the kindness of our foster parents, and entrust them to take good care of our doxies until they find their forever homes. Most dachshunds will need to be in foster care for one to three weeks, depending upon their condition at intake and the availability of permanent homes. Although we would love to accommodate everyone interested in volunteering, we do have a few basic requirements. You must fill out an application, participate in a phone interview and welcome a home check from one of our volunteer coordinators. You must own your home or have permission from your landlord to have dogs in your home, and your home must be secure and dog-safe. Although we do not require our foster parents to currently own dachshunds, they should have some experience with the particular personality and needs of the dachshund. We will provide educational materials and training, as necessary. Provide food, water, exercise, toys and love to their foster dachshunds. Observe the behavior of the dachshund and report any issues to SCDR. Implement training techniques as recommended. Provide a safe, temporary home for dachshunds in need. Although wonderful companion animals who deserve loving, safe, forever homes, rescue doxies are far from perfect! Many have been surrendered by their former owners for minor issues such as mild separation anxiety, dominance behavior, mild aggression, barking, puppy behaviors (chewing) or housetraining issues. We believe these issues can be remedied, and we give our foster parents the tools they need to help their charges overcome these problems. Finding a home for the dachshund. Paying for any medical treatment or medication. Conducting home checks or interviewing potential owners. Our foster parents will need to have patience and be able to set consistent boundaries. Also, it is beneficial if our foster parents either work from home, are retired or are otherwise home much of the day. If you are interested in fostering for SCDR, the first step will be for you to fill out an application. Please email us for more information. Contact dena@scdr.org for donation drop off location! If your pet has been diagnosed with heartworm disease via a heartworm antigen test (the most common form of testing), this is what you can expect to happen next at your veterinarian’s office. A test for microfilariae (juvenile heartworms in the blood stream). If no microfilariae are found, a confirmatory test for adult heartworms should be run. Complete blood cell count, blood chemistry tests, a urinalysis, and chest x-rays to assess your dog’s overall condition and plan the safest way to move forward with treatment. Other tests may also be necessary based on a dog’s individual case. If the dog’s condition is especially severe, appropriate stabilization therapy is necessary. Begin treatment with prednisone to reduce the chances of a bad reaction to the death of heartworms. Hospitalize the dog for the day and give a heartworm preventative to kill juvenile heartworms in the blood stream. Continue to give heartworm preventatives monthly. Give doxycycline for one month to reduce the chances of a bad reaction to the death of the heartworms. Give the first injection of melarsomine. Restrict exercise, continue prednisone, and closely monitor for side effects for the next 30 days. Give second injection of melarsomine 30 days after first. Give third injection of melarsomine one day after second. Continue prednisone and monitor for side effects for next 30 days. Continue exercise restriction for another 6-8 weeks. Test for microfilariae (juvenile heartworms in the blood stream) approximately one month after third melarsomine injection. 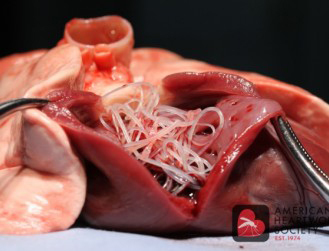 Test for adult heartworms and microfilariae approximately 6 months after third melarsomine injection. Please Refer Your Friends to our Website!